Organized by the Association of Cretan Olive Municipalities (ACOM) and other Cretan entities under the auspices of the International Olive Council, the October 17 conference at the Mediterranean Agronomic Institute of Chania (MAICh) began with remarks from local and regional politicians and dignitaries, followed by an instructive talk by ACOM’s scientific advisor. Giorgos Marinakis, mayor of Rethymno and president of ACOM, argued that olive oil’s health benefits actually make it less expensive than cheaper seed oils that lack those benefits, if we consider the big picture. Chemist Manolis Michelinakis later added more about the health benefits of olive oil polyphenols, when he outlined the chemical properties of olive oil. Apostolos Voulgarakis, vice governor of the Region of Crete, discussed the high quality of Cretan products, mentioning olive oil’s important role in the history of Crete since Minoan times. Pointing out the need to appreciate olive oil’s true value today, Anastasios Vamvoukas, mayor of Chania, encouraged greater efforts to link it to gastronomic tourism. Georgios Baourakis, director of MAICh, added that many tourists purchase Cretan olive oil and take it back to their home countries, allowing more consumers to discover its quality. In order to better enable tourists to appreciate that quality when they eat in Greek restaurants, and better prepare them to be ambassadors for Greek olive oil, ACOM was one of the early advocates of the legislation that now requires properly certified non-refillable or single use packages of branded olive oil on restaurant tables. 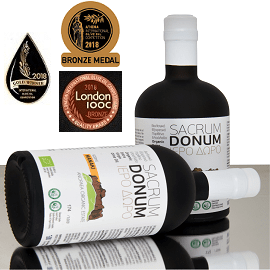 As ACOM’s scientific advisor, Nikos Michelakis, explained, the goal is to offer tourists the best possible flavors and health benefits from olive oil, rather than olive oil degraded by the sun, air, and heat that attack it in the refillable clear glass containers used previously. Michelakis provided additional details about the use of olive oil in restaurants catering to tourists, based on ACOM’s survey results. Given their awareness of olive oil’s health benefits, all the tourists surveyed were willing to pay at least an additional 25 cents per portion for food cooked with olive oil, with the majority (59%) ready to pay 75 cents more per portion. Asking why customers should pay for bread and water but not olive oil, Michelakis recommended listing different types of olive oil for sale on the menu, like wines. Michelakis argued that olive oil can help expand tourism both geographically, toward the interior of the island, and temporally, beyond the summer months, as olive mills, olive oil museums, monumental olive trees, and olive harvest activities draw the attention of tourists. Moving on to the many uses of extra virgin olive oil (EVOO) in restaurants, Chef Manolis Papoutsakis, who appears on Master Chef Junior on Greek television and owns the Charoupi Cretan restaurant in Thessaloniki, emphasized the importance of overcoming his customers’ initial difficulties accepting the bitterness of many EVOOs. Since gastronomic culture valorizes sweetness over bitterness, a change to dressings and foods made with EVOO can seem challenging. 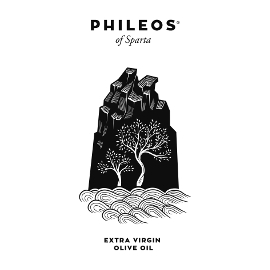 Papoutsakis attempts to convince customers that it is worthwhile because that bitterness is both an indication of EVOO’s health benefits and a unique flavor enhancer. Papoutsakis recommended finishing most dishes with EVOOs, allowing their various fruity, spicy, and bitter flavors to add a distinctive taste to cooked greens, vegetables, potatoes, meat, and fish, as well as salads. He mentioned that a mild olive oil such as a Tsounati or one made from riper olives works well with mild fish. 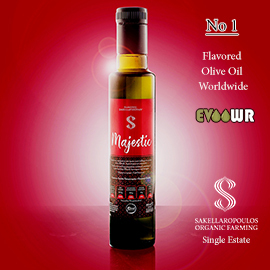 He likes to add a bit of fresh EVOO to boiled meat or chicken that has lost much of its tastiness during cooking, to moisten it, transform the flavor, and add healthy fat. 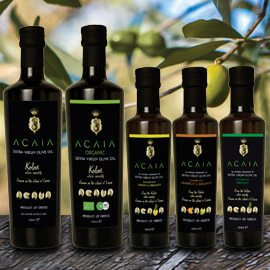 Even if we cook with EVOO, he suggested, we need to add its good raw freshness after cooking as well. Yiannis Tsivourakis, Corporate Executive Chef at the Minoa Palace Resort in Platanias, Crete, discussed frying with olive oil, dismissing myths about smoke points and cooking temperatures and clarifying that olive oil is well suited to frying. In fact, he said, it can be re-used many more times than seed oils. MAICh chef Yannis Apostolakis added that he always uses extra virgin olive oil in stews and marinades, before grilling, to grease pans, and in baked foods ranging from meat to cake. 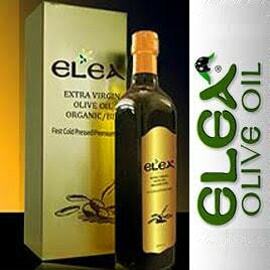 How can we tell if we have an extra virgin olive oil? 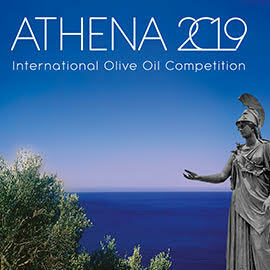 Olive oil tasting panel supervisor and international judge Eleftheria Germanaki explained that EVOO is a fruit juice that has certain chemical properties, has no defects in its flavor or aroma, and tastes fruity, according to the organoleptic analysis of a team of 8-12 trained tasters. Olive oil is the only food with official tasting rules to define it, with official terminology and categories defined by the International Olive Council. Audience members were invited to explore the flavors and aromas of several different olive oils at an educational tasting event led by members of the Food Technology Lab at Elgo Dimitra’s Institute of the Olive Tree and Subtropical Plants in Chania. After an explanation of the tasting procedure, participants tasted and smelled the difference between extra virgin, virgin, and poor quality, defective olive oils, then tried to match one bottled EVOO sample with one of five unmarked EVOO samples. Before the guided tasting, ACOM presented awards to five Cretan olive mills for best practices in the trading and distribution of olive oil. (See the list of winners below.) The event concluded with a light lunch featuring traditional Cretan dishes made with Cretan olive oil by the MAICh chef and his assistants. This World Olive Day celebration was co-sponsored by ACOM, MAICh, the Region of Crete, the Municipality of Chania, the Institute for Olive Tree and Subtropical Plants in Chania, and the Association of Catering Professionals in Chania, under the auspices of the International Olive Council. Thanks to ACOM for the photos that appear with this article.